Purple aliens are in the popular press as of late, with headlines claiming “First Aliens We Discover May Be Purple!” and such. It all stems from an article appearing in the Astrophysical Journal, which is a bit more interesting (and certainly more cautious) than many of the popular articles. The basis of the article starts with a curious bit of biology. Modern plant life is green because plants use chlorophyll, which is used in the process of photosynthesis. Chlorophyll appears green because it reflects light in the green range of the visible spectrum, and absorbs light in the red and blue. This has always been a bit of a curiosity, since sunlight is brightest in the yellow-green range, so why would plants reflect the brightest color of the spectrum and absorb red and violet where the Sun gives off less energy? It turns out there is another molecule that can also be used for photosynthesis known as retinal. Retinal absorbs green wavelengths and reflects red and blue, so organisms that use retinal can appear purple. For example, there are varieties of purple sulphur bacteria that exist in sulphur springs and other anaerobic environments. Whereas chlorophyll photosynthesis produces oxygen as a byproduct, retinal photosynthesis doesn’t. Retinal is a simpler molecule, but retinal photosynthesis is less efficient than chlorophyll. So one idea is that retinal-based organisms evolved on Earth early on, and chlorophyll ones appeared later. Being more efficient (despite reflecting green) they came to dominate. Now, I’m not a biologist, so take all that with a grain of salt. The upshot is that there is some evidence that early life on Earth might have used retinal, and thus appeared purple. So if you want to look for life on exoplanets, it would be worth looking for a spectral fingerprint of retinal-based life. But what would such a spectral fingerprint look like? This, in part, is what the paper tries to answer. What the team actually did was to simulate the spectrum of Earth during the Archean eon as if it were an exoplanet. 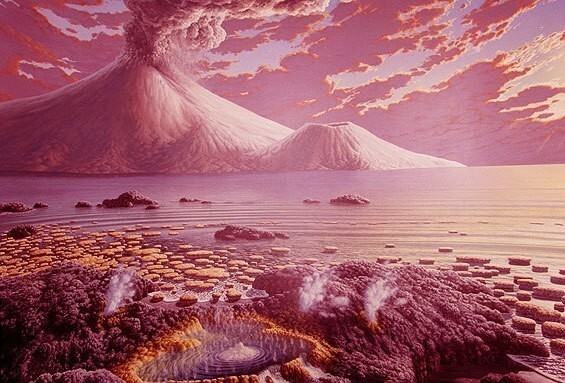 The Archean Earth was considerably warmer than our current planet, with an oxygen-free atmosphere and early forms of archaea and bacteria (as seen in the artist rendering above). The team modeled this Archean Earth with different variations (lots of clouds, few clouds, mostly oceanic life, land life, etc.). They then did a simulation of an exoplanet observation (what’s known as a disk-integrated spectra) as it would appear through various optical filters. What they found was that features such as the land mass ratio and cloud cover levels could be detected from a sufficiently good exoplanet spectra, which agrees with other simulations. And if a life form similar to purple bacteria covers a decent amount of land surface (and the cloud cover isn’t too significant), then we could see a spectral signal indicating its presence. While some of the popular press wants to sensationalize this work, the actual conclusions of the work is pretty exciting. With good data and a bit of luck, we could detect evidence of life in the spectra of an alien world. This is what should be in the headlines. It is theoretically possible not only to gather information about atmospheric conditions and surface features of exoplanets, but actual evidence of life. Take for granted that if you discover that there aliens around the universe.What will you do next?